Fantasy or comedy? I couldn’t decide which way to label the Obama budget, so I went with both. The bottom line is that the Obama administration has brought forth the most unbelievable revenue increase that I have ever seen proposed in a budget, a whopping 65% increase in revenues in just four years, which will – miracle of miracles – drop the deficit as a per cent of GDP from nearly 11% to just 3.2% over those same four years. The only problem with this scenario is that it stands virtually no chance of actually happening. Revenue will be far lower than projected and the deficit correspondingly higher. One of my abilities is spotting bogus numbers quickly, and another is to make reasonably accurate projections without a staff of hundreds. For example, in 2009 I called for the Social Security fund to soon begin dipping into negative territory when the CBO was clinging to the illusion that 2017 was the ‘below zero’ date. Turns out I was right, and it wasn’t a terribly difficult call to make. A little trend projection here, some assumptions about early retirement there, a higher and more realistic assessment of peak unemployment, and – voila! – a reasonably accurate projection was made. The green circles show the rosy deficit-reduction estimates, while the red arrows indicate the incredible 65% increase in federal revenues over a single four year period. 65%! How likely is that? Is it realistic? Perhaps a little history is in order here. 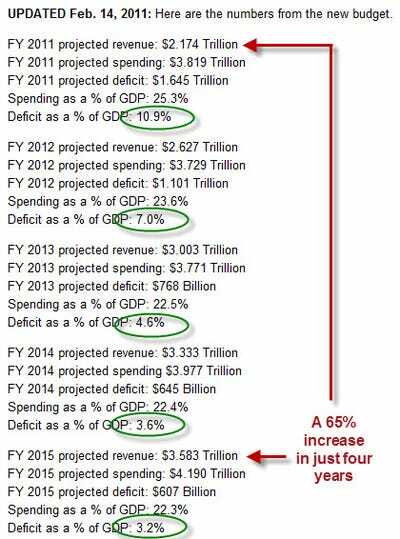 Let’s start by asking a question: In any other four-year period, have federal revenues increased by 65% or more? The answer is yes, but it’s a very qualified yes. In the first chart below, the red bars show the proposed revenue increases on a rolling four-year basis. That is, each year is compared to the revenue period four years prior. The blue bars are the same, only they represent actual history, not projections while the red bars are the Obama team projections. The second chart is a comparison to CPI to make a point. Over the past 60 years, there have only been three other years with a similar or higher rate of revenue growth to the one estimated to occur in 2015: 1979, 1980, and 1981. There are two things we might note about those prior three years (’79-’81) of rapid federal revenue growth. The first is that those same years represent the second, first, and fourth highest rates of yearly inflation in 50+ years of data, coming in at 11.3%, 13.5%, and 10.4%, respectively. Does the Obama budget assume similar enormous rates of inflation? Nope. It assumes 2% or less inflation in every year of its projections out through 2015. So it’s not inflation that will be driving the enormous revenue growth. Another reason we might anticipate extremely strong revenue growth is because of a rapid expansion of GDP. Here again in 1979, 1980, and 1981, we saw something very unusual in the data: Those years clocked exceptionally robust GDP growth at 11.7%, 8.8%, and 12.1%, respectively. Out of 65 years of data, those were the 4th, 5th and 17th fastest years of economic expansion. Could that be the driver behind Obama’s optimism? Is his team calling for double-digit GDP growth over the next few years? Do they envision ‘top 10’ like performance for a couple of those years? Not according to their published data. So we can’t really defend the projected increase in revenues on the assumption of massive economic expansion either. The Obama team does predict a pretty decent expansion – but on a relative basis, it’s nothing spectacular and is less than half that which drove the revenue expansion in the 1979-81 period. So the 65% revenue increase will not be driven by either inflation or GDP expansion. What if we compare the projected increases historically on an inflation-adjusted basis – would that put them in a better and more believable light? In this next chart, we simply chart each year’s federal revenues after correcting for CPI (we used the Obama budget CPI assumptions for the years 2011 – 2015 to discount the future so everything is in 2010 dollars). Are these numbers any less fuzzy? Nope. Even on this basis the proposed revenue increases are the largest on record, bar none. There is almost no chance of the Obama revenue projections coming to pass, unless massive tax increases are part of the deal, and as far as we know, they aren’t. Here’s my prediction; we’ll have sub-par growth in 2011 and relatively weak growth in 2012, with a 50% chance of a double-dip appearing in one of those years. As such, revenue growth will be slightly below average between here and 2015. Using these assumptions, and generously assuming that things more or less carry on as normal and even more generously that the economy magically grows to $19 trillion as the Obama team has assumed, the actual budget deficit will be no less than 8% of GDP each year between here and 2015. My estimates translate into a roughly $1.5 trillion cash deficit each and every year — give or take a little — digging our national debt hole deeper by another $7.5 trillion by 2015. This, however, is merely my starting bid. I can easily envision deficits that are far higher in both aggregate and per cent-of-GDP terms, due to some combination of rising energy prices and debt overhang dragging the GDP figure downwards, and rising interest rates driving federal costs higher. The bottom line is that either this budget is a fantasy, or I am completely wrong and we somehow set historical records for revenue growth during a time of low inflation and below average GDP growth. It is against this backdrop that you should be especially dismissive of any and all partisan rhetoric that proposes to reduce the deficit by trimming this or that program by a few billion here and there. Until and unless you hear about cuts to the big four – Defense, Medicare, Medicaid, and Social Security – you can be certain you are merely listening to partisan talking points aimed at posturing for the next election, not credible plans for attacking the root of the problem. The US is facing a deficit pattern (deficits higher than nominal GDP growth) that has ruined many a country before. A failure to legitimately address this condition before being forced to do so by global or market circumstances will lead to a far rougher period of adjustment than necessary. Such a failure even risks it all: a sudden loss of reserve currency status for the US that leads to a sudden repatriation of some $7 trillion in US-dollar-denominated assets currently held off-shore. Said simply: The risk is a massive inflationary event that forces the Fed to choose between defending the dollar (by raising interest rates) or defending the US economy. It can’t do both at the same time. Those interested in learning more about how events will likely play out from here can read our Guide to Navigating the Coming Crisis (free executive summary; enrollment required for full access).